1 can corned beef hash or hash made from slow cooked corned beef. 1. Cook the potatoes ahead of time, until they are just tender when poked with a fork. 2. 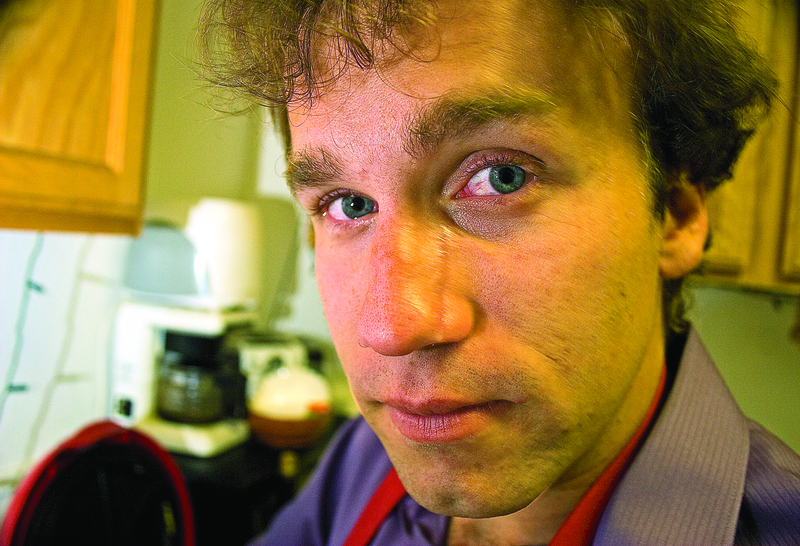 Cook the beans, or buy canned beans. 3. Heat a skillet over medium high heat. Put the hash into the skillet and cook until it begins to lightly brown. 4. 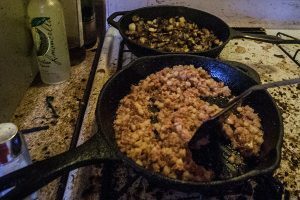 Either remove the corned beef hash to container and add the diced potatoes, with some oil, or heat another skillet on high, add a little oil, and toss in the diced potatoes. Shake salt over the potatoes and cook until lightly brown. 5. (Optional) Cook the eggs, if scrambled, and remove to plate or bowl when done. 7. Briefly heat the first tortilla in the microwave or in the skillet, until just a little warm and pliable. 8. 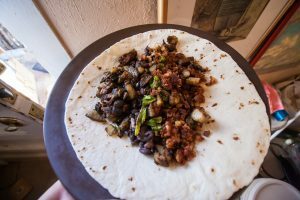 Add the ingredients you’re using to the center of the tortilla, including the hash, potatoes, eggs, beans, chile and anything else, roll, and serve with red chile, salsa, sauce and garnish with lime slices. See all the photos here, in Flickr. 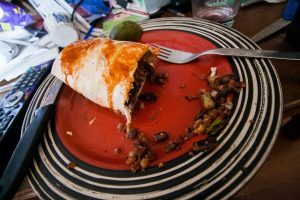 The burrito before rolling. Left to right: Pan-fried potatoes, black beans, green chile, corned beef hash. The corned beef hash burrito, with Tapatio on top and lime. 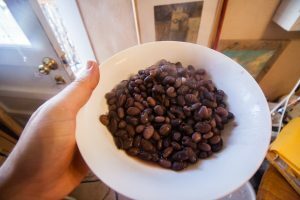 The black beans, after they’ve been cooked in the electric pressure cooker, and before they’re thrown in the skillet to lose any extra liquid. 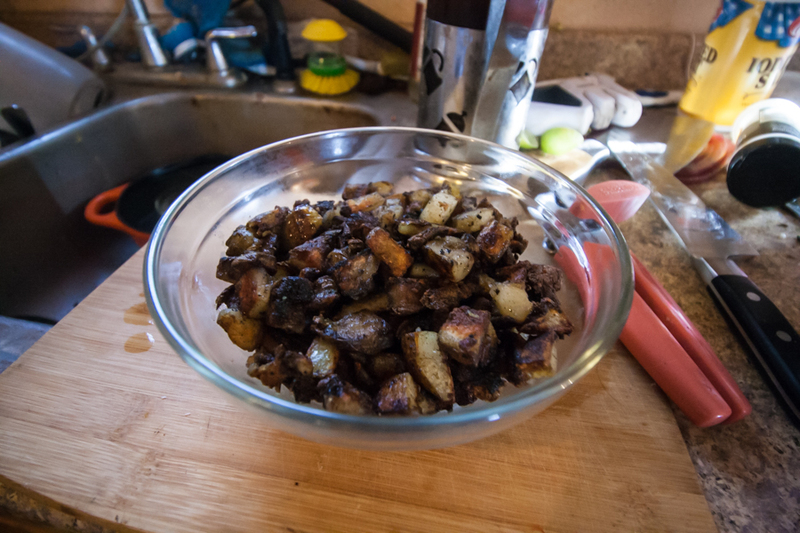 Diced potatoes, pan fried, before being added to a corn beef hash burrito. The potatoes were cooked in an electric rice cooker (InstantPot) which reduced the cooking time and simplified the process. The corned beef hash (front) and potatoes (back).